Moscow said it would halt operations in Aleppo on Thursday for an eight-hour span between 08:00 (05:00 GMT) and 16:00. 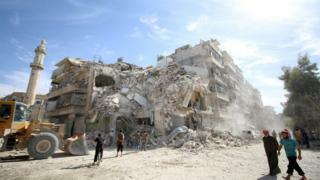 The Russian defence ministry said the pause was agreed so that civilians and rebels could leave the city. But UN agencies say at least 12 hours will be needed for that to happen. Russia's announcement came on the day 14 members of one family were reportedly killed in a strike in Aleppo. Volunteer rescuers in Syria said eight children and two women were among the dead after heavy bombing in the past 24 hours, with "bunker-buster" munitions shaking the ground. Russian defence ministry official Sergei Rudskoy announced the pause in attacks on Monday afternoon. "For that period, Russia's air force and Syrian government forces will halt air strikes and firing from other weapons." Mr Rudskoy said Russia was working towards a solution on Aleppo, but that "reaching an agreement on all issues may take a long time". "Therefore, we have taken a decision not to waste time and to introduce 'humanitarian pauses', mainly for the free passage of civilians, evacuation of the sick and wounded, and withdrawal of fighters," he said. Russia has come under increasing criticism from Western nations for its attacks on rebel-held east Aleppo, with the US and several prominent political figures accusing Moscow of war crimes. The EU Foreign Affairs Council also published findings on Monday that concluded Russia's involvement - along with Syrian government forces - may amount to war crimes. "The deliberate targeting of hospitals, medical personnel, schools and essential infrastructure, as well as the use of barrel bombs, cluster bombs, and chemical weapons, constitute a catastrophic escalation of the conflict... and may amount to war crimes," they said.